Very nice plane and weathering! How did you make the weathering on the d-day stripes? Now i can see the pics , and what a pleasure that is! c’mon Pierre! I will become a huge fan of your work! Impressive! One of the most beautifull FW I have ever seen! stunning! Hi Sprue, this is a very nice Spit, and then read that this is a model of the Spit Jean Offenberg was flying makes it very special. I am a Belgian and specially interested in the Belgians flying in the RAF during WW2 so i don't only love the model but also the story behind it... I hope i don't take over your topic but here a little more information about Offenberg found on the website of the Battle of Britain London Monument: "Jean Henri Marie Offenberg was born at Laeken on 3rd July 1916. When the Germans invaded Belgium he was a pilot in 2 Group, 4th Squadron, 2nd Regiment d'Aeronautique. He destroyed a Do17 on 10th May. After the country was overrun he flew with other pilots and their Fiat CR42s to France. At the request of the French the Belgians were put on aerodrome defence at Chartres. Offenberg and his fellow Belgian, AR Jottard, took two Caudron Simouns on 20th June and flew to Corsica, then to Phillipeville, Algeria, then to Oujda, where the Belgians had set up a training school. Finding morale there to be low the two took a train to Casablanca. Here they met some other Belgians, who were trainee pilots, and some Poles. The Poles had permission to sail that evening in a cargo boat for Gibraltar. The Belgians and some French airmen slipped aboard with them. They transferred to a British ship at Gibraltar and disembarked at Liverpool on 16th July 1940. Offenberg went to 6 OTU Sutton Bridge on the 30th and on 17th August he joined 145 Squadron at Westhampnett. He claimed a Do17 destroyed on 8th September, probably destroyed a Me109 on 27th October, destroyed a Me109 on 1st November, shared a Me109 on the 6th, damaged a Ju88 on the 9th and shared a He111 on 11th December. On 5th May 1941 Offenberg claimed a Me109 destroyed plus a He60 with another damaged. 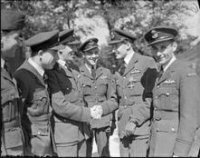 He was appointed 'B' Flight Commander on 21st May 1941 and awarded the DFC in June, the first Belgian to receive this award. On 17th June 1941 Offenberg was posted to 609 Squadron at Biggin Hill. He destroyed a Me109 on 22nd June and another on 7th July. He was awarded the Croix de Guerre (Belgian) on the 21st and became 'B' Flight Commander on the 27th. Offenberg probably destroyed Me109's on 19th July, 6th August, 27th and 29th August and damaged two more on 27th September and 13th October. Whilst training a new pilot on 22nd January 1942, Offenberg was subjected to a mock attack by a pilot of 92 Squadron. This resulted in a collision and the tail unit of Offenberg's aircraft was cut off. He was only at 1000 feet, went into a vertical dive and was killed in the crash. He was buried with full military honours on 26th January in Scopwick Church Burial Ground. As well as his five confirmed victories Offenberg was credited with five enemy aircraft probably destroyed and seven others damaged. After the war his remains were reinterred at the Pelouse d’Honneur Cemetry in Brussels at Evere." You are very modest and maybe you had to repaint it a dozen time but the result is really wonderfull! I love that Jug! Very nice model! Will save the pictures for the moment i will ever make a falcon so i can use yours as an example! Was also wondering about the weathering, do you use oils? When I see this, I instantly know why I love modelling so much... This is really great! Not only the Hurricanes but also the story and the magnificant diorama! Congratz! Very beautifull plane and a very nice story! Yep it's another 109 I'm afraid. What a nice 109! I did never seen that kind of camouflage but i really like it... Nicelly done, i would be very happy and proud of it! Is it in scale 1/48?